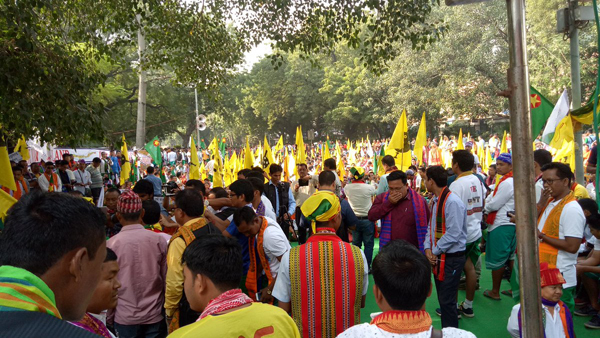 The All Bodo Students’ Union (ABSU) members staged a maha dharna for a separate Bodoland at Janthar Manthar, Sansad Marg in New Delhi on Thursday. The members of ABSU blamed Narendra Modi government for their ‘fake-promise’. “The BJP had promised us a separate Bodoland during the campaign of 2014 General Election, but they have not kept their promise,” said ABSU president Pramod Boro. The demand for a separate state for Bodos, which dates back to the 1960s, was raised with the Centre last year. “In that meeting, the home minister had told us that our demand for a separate state is an old one, which everyone is aware of. The Centre would certainly look into the feasibility of the demand. When we asked him how long he would have to wait, he had assured us that the talks would continue. But it has been more than a year since we sat down for discussions,” Pramod Boro said. Last November, three organizations had sent a memorandum to the Prime Minister with their ‘blood signatures’, demanding some progress in the Bodoland talks, reports Pratidin Time. The protestors in New Delhi said that they will continue their protest until Centre fulfills it.